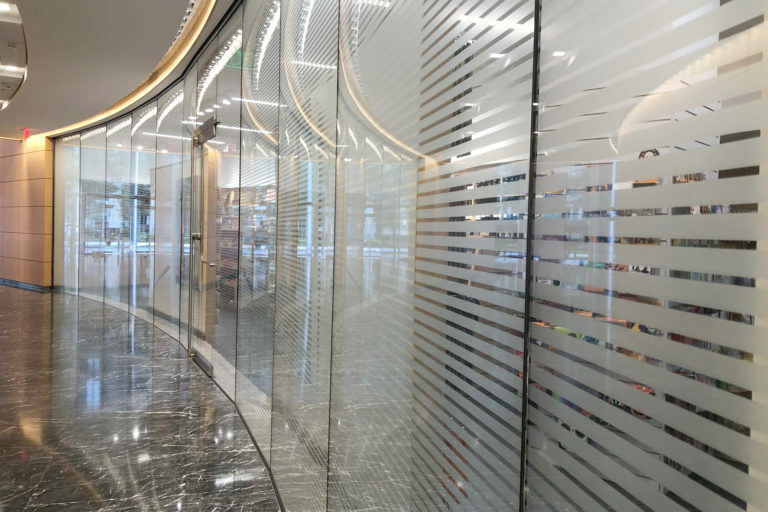 Glass + Mirror Craft fabricates a wide variety of colored and textured glass, and its graphics design team delivers virtually any custom pattern to make your vision come to life. 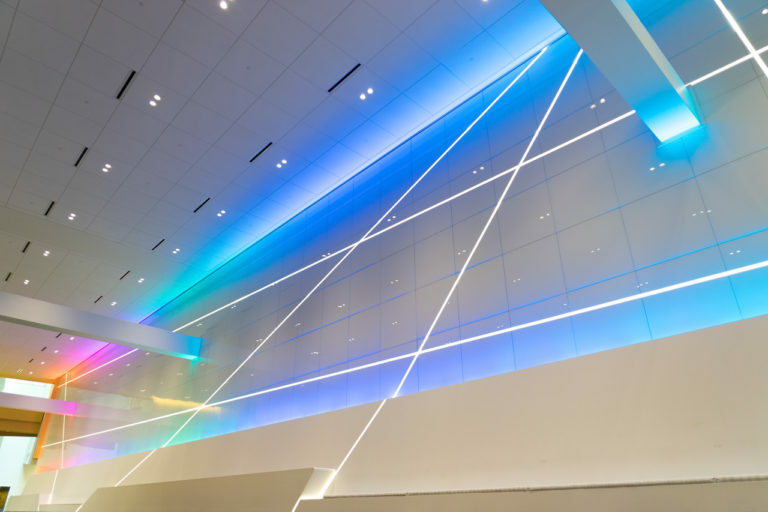 For this major convention center in Ohio, Glass + Mirror Craft delivered 508 back-painted glass panels totaling 8258 square feet of glass, installed as four color-changing node glass feature walls throughout the space. G+MC assisted in the design of this awe inspiring architectural system; provided product and back-light testing; and fabricated the glass. An overlapping stripped pattern across the glass panels required precise measurement. The custom colors featured in the panels was continuously evaluated using state-of-the-art equipment to ensure each glass panel matched as intended to those surrounding it. Each panel was then kitted and delivered to ensure timely, continuous installation. Glass + Mirror Craft’s engineering, project management, decorative, and logistics teams delivered on the architect’s stunning vision, setting the Center apart from all others. Working with Alliance Glazing, Glass + Mirror Craft provided several custom architectural systems of glass and metal components for this futurist building design of the esteemed Cesar Pelli. A key element was a laminated, screen-printed glass wall following the primary traffic corridor in the building’s piazza. Each glass panel has its own individual screen – featuring slightly different pattern densities and thicknesses – based on where it is installed in the project. Precise alignment was critical to the overall effect, and Glass + Mirror Craft was able to deliver on that vision. Prior to delivery, the glass panels were kitted to simplify and speed installation. 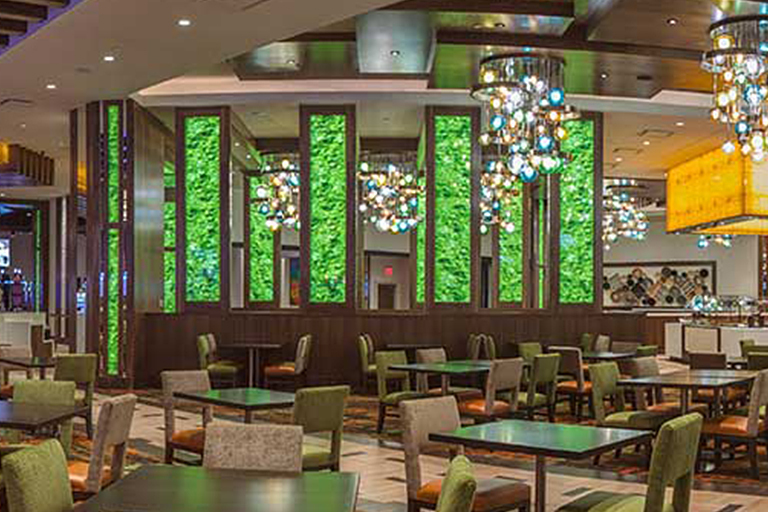 Calvin & Company selected Glass + Mirror Craft to provide an architectural system of custom laminated decorative glass panels as a featured element of a renovation at Gun Lake Casino in Wayland, Michigan. The architect’s vision was to fill a central eating space with green stained glass. G+MC’s decorative team provided an optimal solution: tempered glass laminated with a custom pattern that simulated stained glass, delivered at a fractional of the cost. G+MC designed the pattern, fabricated the glass, and kitted the entire project to flow installation. The result is a stunning effect that glows the space. 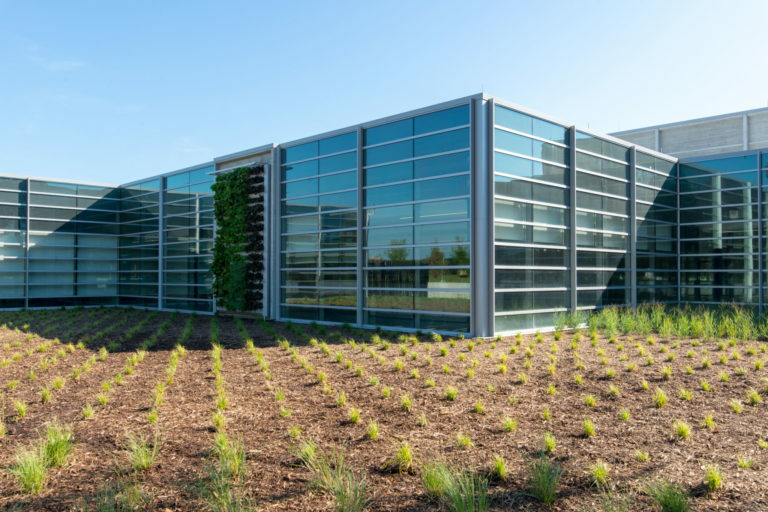 Edward’s Glass Company contracted Glass + Mirror Craft to provide several thousand square feet of custom-pattern, fritted, insulated glass units for this confidential facility located in Michigan. The frit pattern, allowing 50% light, combined with Guardian’s premium SNX6227 on Ultra Clear, provides optimum functionality and clarity. As with all its architectural systems, G+MC delivered the glass in kits packaged to flow installation. 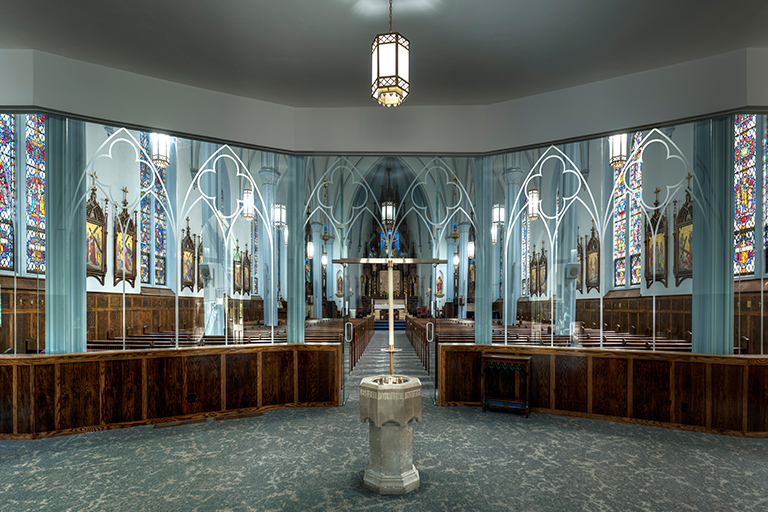 For St. Mary’s Catholic Church in Fort Madison, Iowa, Glass + Mirror Craft delivered an architectural system consisting of tempered, etched glass in a stunning Gothic design that forms a new vestibule for the building. As with all its architectural system, G+MC delivered the glass in kits that simplified installation. 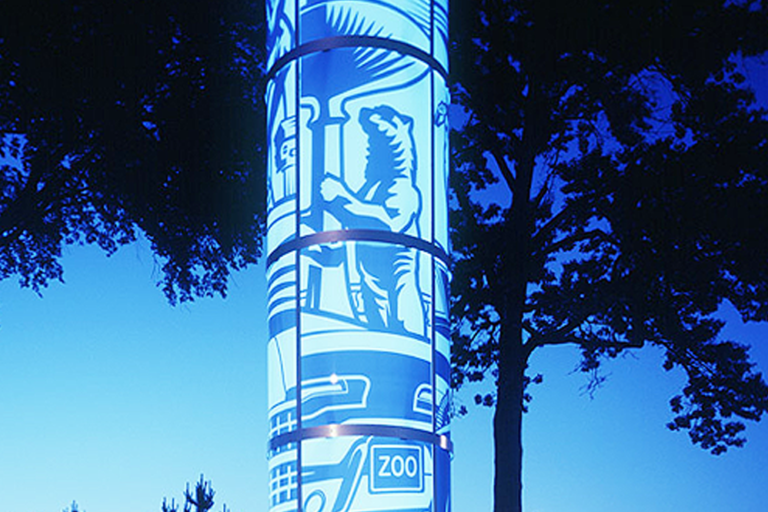 Glass + Mirror Craft was selected to provide four illuminated glass towers that grace Detroit’s historic Woodward Avenue. For the architectural system featured here – a tower for One Detroit Center – G+MC laminated two pieces of glass with a thermoplastic interlayer based on a custom design. Interior lighting makes the tower take on a alluringly different feel at night. 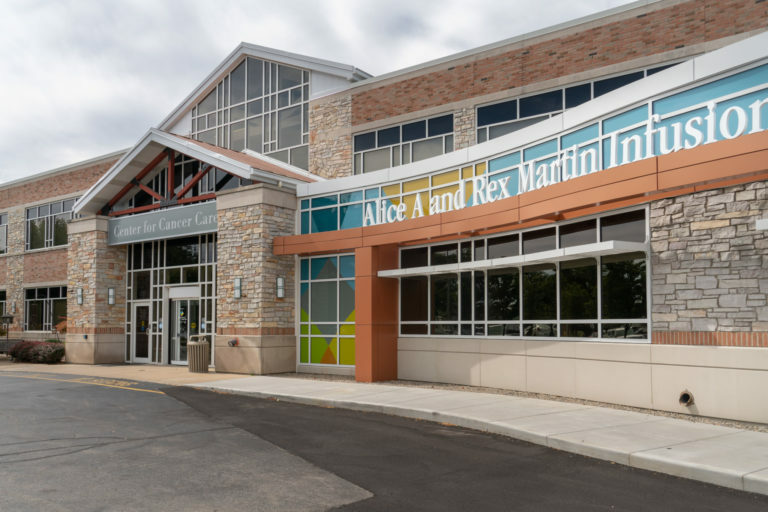 Hall Aluminum Products selected Glass + Mirror Craft for its ability to fabricate the range of decorative glass, decorative laminated glass, and laminated insulated glass specified for the new Goshen Center for Cancer Care in Goshen, Indiana. The exacting custom color and pattern requirements, all required under a tight timeframe, made the project challenging. In response, a dedicated Glass + Mirror Craft project manager assembled an in-house team of G+MC engineers, graphic designers, and IG specialists to deliver the glass on time and in kits that simplified installation. 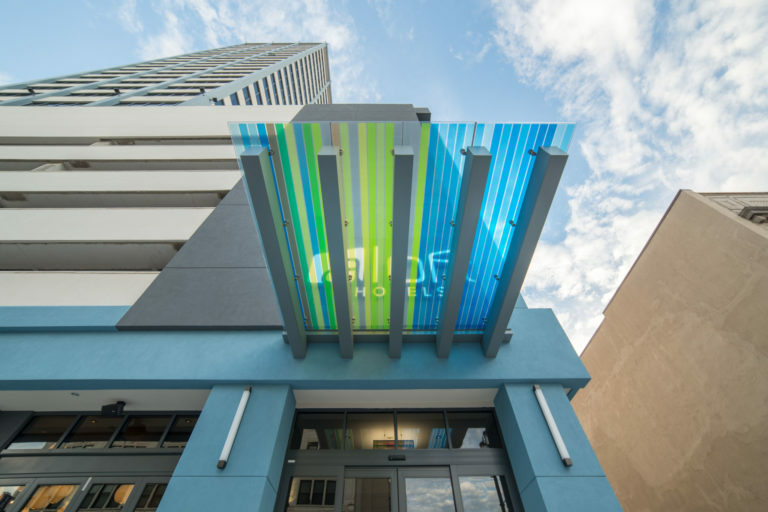 Glazier Precision Wall Systems chose Glass + Mirror Craft as a single source for the range of fabrication requirements needed to deliver this brightly colored glass canopy for the Aloft Hotel in South Bend, Indiana. The architectural system consists of six tempered, laminated, colored glass panels. Cuda Metals, the in-house metals fabricating division of G+MC, manufactured the custom attaching hardware from drawings provided by G+MC engineering. 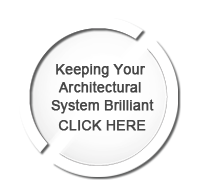 The entire system was kitted for ease of installation and delivered with stamped drawings. Diamon-Fusion is UV stable and eco-friendly, and can also contribute to LEED points as it is approved by the United States Green Building Council (USGBC) as a protective coating.